The next picture shows a cat resting happily in her basket looking calm as water. It may interest your kid to learn that a cat cleans her kitten using her tongue. Let your kid go crazy and color all kittens using different colors! Fact: Kittens often fight with each other. They scratch and even bite each other while playing, in a sweet manner. Here is an image that shows a mother cat with her two little kittens. You can help teach your kid the different sounds that cats make. The big moon in the background is sure to attract your kid’s attention, and she will have a fun time filling colors. Fun fact: Cats usually love to fight, but most of the time they do it while playing. Tell your kid how mother cats are extremely protective about their kittens. Your kid will love to color this picture of three cats. This picture emphasizes the importance of a mother to all creatures. Ask your kid to identify the father cat, the mother cat and their little kittens. 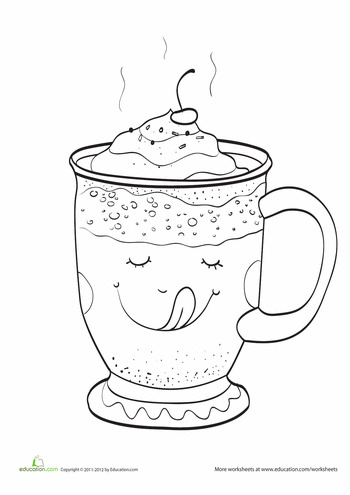 Your kid might need assistance while coloring this one due to certain complex elements in it. The picture is simple yet shows variety. To Tell: While your kid colors this beautiful picture you can take the opportunity to tell her about the importance of family. Here we see a picture of two baby cats curiously trying to play with the soft toy of a dog. These free printable cat coloring pages online will not only to increase your kid’s creative skills, but also a way to create a stronger bond between you and your kid. So enjoy this lovely and creative activity together. You can sure make it more fun by inviting your kid’s other friends over to your home and have them all color different cat pictures to color together. You can also create your own cat coloring book to make them learn better in company of their friends. Here is an adorable picture of a mother cat and her baby cat playing with a yarn of wool. Let your kid choose which color she wants to use for the bow of the cat. This one is a good picture, showing the side profile of a cat and can be used as a poster once colored by your kid. If your kid likes dressing up her pet cats using accessories, this picture will invoke a new idea for sure. Fact: Cats are very friendly creatures and like to explore everything around them. In this picture, two cats are getting ready for a cat-fight, with a witch on a broom in the background. This adorable picture shows a kitten playing with a ball of wool. If your kid has a cat as a pet, she will know that cats usually like to sleep in cozy and warm places. Your kid might need assistance while coloring the basket, be there to help and guide her. Fact: A cat can sleep for up to 18 hours a day! Much like a newborn baby. 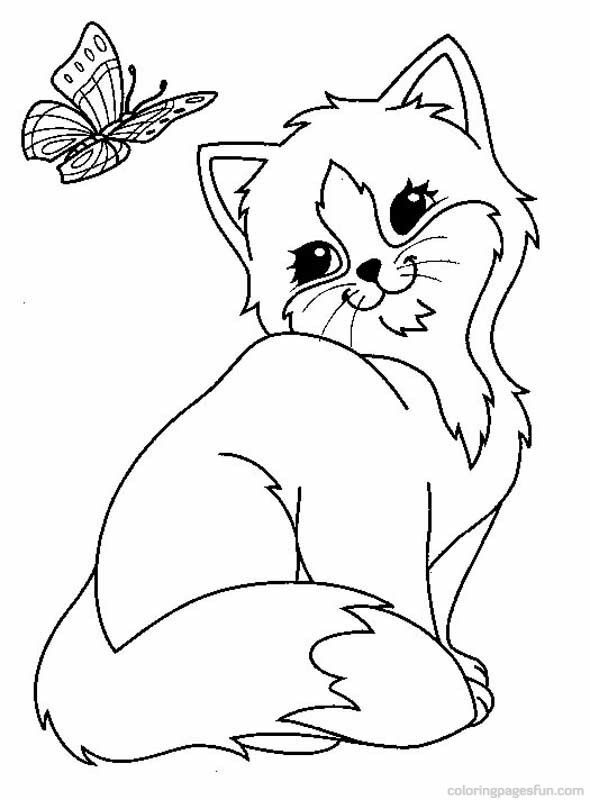 Begin your kid’s coloring activity with PrettyMiss Kitty. Here’s presenting Miss Kitty. Your little angel will surely love to fill up her hat with the most beautiful colors. Here is a small collection of cute cat coloring pages for kids that will ensure your that he has an amusing time as he remembers his favorite furry little friend. It shows two cats, one with stripes like a lion and another normal cat. They both are shown standing in front of their bowls. 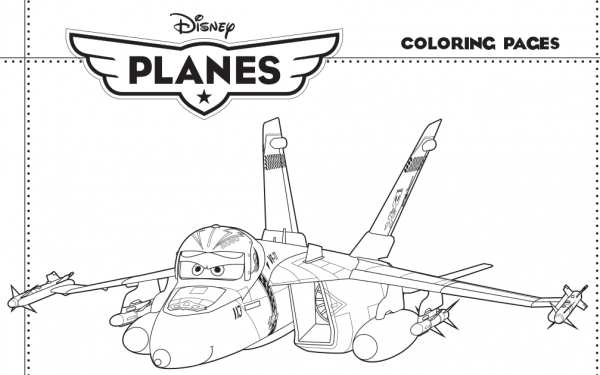 Your kid might find this last piece to be a little challenging, so be ready to help her with coloring. You can discuss a cat’s food habits while she enjoys coloring these free cat coloring pages to print. Cats usually love to play with wool. They enjoy chasing the string and bouncing on the ball of wool. 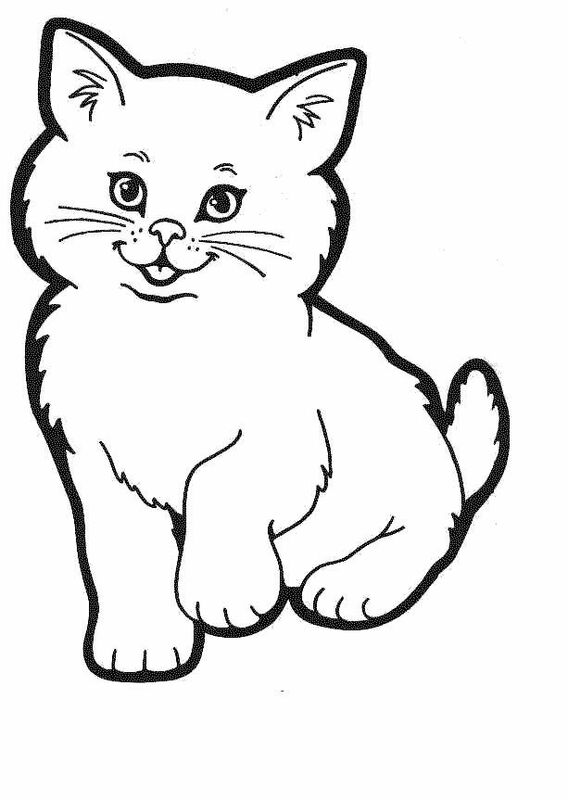 This cat in the picture can be pretty easy for your kid to color due to its big and easy outlines. This picture can be used not only for coloring but also to teach your kid how to spell the word ‘Cat’. This cute picture is apt for children aged between 3 to 4 years. Let your kid explore her creativity by coloring all the butterflies with different colors. Fact: You must alert your child that a cat’s nails are very sharp and so she must be careful when playing with one. A simple picture to color showcasing a sleeping cat. It is easy to fill in with colors due to broad outlines. It is informative too as you can use it to test your kid’s alphabetical skills! Fact: Cats give birth to 3 to 6 kittens at a time! Cat with stripes on his body, resembling tiger’s stripes. Isn’t it interesting? Isn’t this picture funny, showing a cat hanging from a tree branch? We hope that your kid enjoys these cats coloring pages. Kindly send us your feedback. Through this picture, you can tell your kid how all animals love to play together and be friends. It is an extremely interesting picture for your kid, and she can use it to identify different animals present in this picture. Fun Fact: History says that cats and dogs cannot be friends, but this picture totally proves it to be a myth. Here is another picture of a mommy cat playing with her three kittens to follow the previous one. The next picture shows a cat sitting proudly, almost like a lion! This picture can be an example for you to show to your kid that even cats and dogs can be friends. It is a very interesting picture to help your kid color as it focuses on basic appearance of both a cat and a dog. To Tell: This picture can be a good example to teach your kid that friendship knows no boundary or race. You can let your kid choose which color she wants to color the cat. It is a perfect picture for your kid to learn about the basic features of a cat. Your kid would be happy to color her little cat friend. For Fun: Tell your kid that cats make a purring sound when they are happy, she would probably try and listen for one next time she plays with her cat. Tell your kid that cats are extremely agile and can climb to the highest branches of the trees. Help your kid to color the tree, branches and leaves as well. Fact: Big cats such as lions, tigers, leopards and cheetahs are good and fast climbers. Does your girl loves cats? Then this is one of the cutest coloring pages of cats for her. Here you can see a cat lying on the lap of a little girl. It can be a good example to teach your kid that a cat, tiger and lion all belong to the same family – the cat family. Your kid will be very excited to show off his artistic skills while coloring this cat that almost looks like a tiger. An excellent picture to help teach your kid to color inside the lines and develop a steady hand. Your kid can use this picture for his or scrapbook to show a cat’s different moods. Here is a very sweet picture of a cat trying to catch her butterfly friends. Does your kid likes to cuddle up to a nice, warm, furry, four legged little friend? The simple joy of throwing a ball of wool and watching the cat go crazy with excitement to catch it – is certainly one of the favorite moments of life. Your kid will sure enjoy showing off her coloring skills with all the flowers in this picture. Help your kid to choose different colors for flowers. Let your kid explore her imagination. Yu can help her imagine what it would be like to be in a meadow filled with these beautiful flowers. She can also use glitters to outline flowers later. Teach your kid that a kitten is the baby version of a cat, just the way she is yours. This is one of the cat coloring pictures that will your kid in understanding what kind of activities cats like to do. For Fun: Share one of your experiences while you were young and had a fun time playing with your pet cat. You can also not forget your kid’s favorite cartoon, Tom and Jerry, featuring the famous cat Tom. Sure the mention of it makes your kid laugh when he watches their antics on the television. So how about taking this love a little further? Here are a few coloring pages of cats which are sure to keep your kid engrossed for hours in an activity which both of you will enjoy. The next picture is sure to get your kid happy and thrilled just for the cuteness quotient. It shows a cat wearing a pretty little bow on her head. Cats are a lot of fun to cuddle and the picture just shows that. Ask your kid to imagine herself as like the girl in the picture, and think the cat as her pet. It will sure make your kid bubble with joy and laughter as she colors it, making it all the more fun. Ask your kid to write her pet’s name on the paper once she colors the page. To Tell: Teach your kid the importance of always being nice to animals and never to harm them. The picture is big and interesting to color. Do help your kid color the cat’s hat and her roses with red or pink. It would be funny for your kid to try and imagine a real cat wearing this silly yet sweet hat. Fact: Cats are curious creatures and like to touch and play with everything in sight. Cats are very good climbers and pet cats love to climb all over the furniture in the house. Your kid will relate to this if she has a pet already. A very easy picture for your kid to enjoy coloring. Let your child explore her creativity and bring this picture to life using colors of her choice. Here is a beautiful picture of a cat playing with his dog and some bird friends.